Thursdays at 9:00 PM, Fridays and Saturdays at 6:30 PM. Andrew Gombas as Claudio, Anwen Darcy as Beatrice. Photo by Remy. 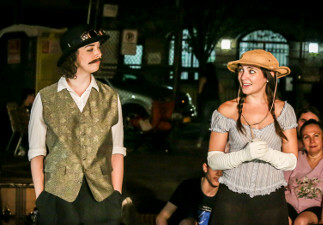 "As You Like It,", directed by Hamilton Clancy. L-R: Jane Bradley (Rosalind) and Elaine Ivy Harris (Celia). Photo by Lee Wexler/Images for Innovation. Transformed to a battle of the sexes set in the South. HOW DO I GO TO BRYANT PARK SHAKESPEARE? * Bryant Park is located on 6th Avenue at 42nd Street, in midtown Manhattan. * ALL ADMISSION IS FREE. * Show times to all three plays are Thursdays at 9:00 PM, Fridays and Saturdays at 6:30 PM, most Sundays at 2:00 PM (check links here for Sunday schedules). * Food kiosks serve affordable meals, capacious rest rooms are close at hand and seating on bistro chairs is guaranteed for everyone. * Best of all, there is no waiting in line for tickets. Brian Patrick Murphy as Proteus in "Two Gentlemen of Verona" in Bryant Park, 2015. Photo by Rosalie Baijer.